PRESS RELEASE – The Commemorative Air Force’s (“CAF”) Airbase Arizona Aviation Museum, located at Falcon Field in Mesa, Arizona, announced plans today for the annual RAF Cadet Memorial Service at the City of Mesa Cemetery located at 1212 N. Center Street, Mesa, Arizona on Sunday morning, November 9, 2014 at 10:45 AM.The Memorial Service honors the 23 RAF Cadets who lost their lives in flight training at #4 British Flying Training School (which ultimately became Mesa’s Falcon Field) during World War II. 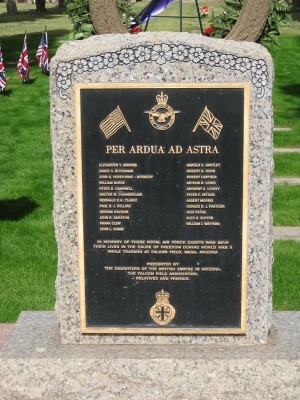 Once cadet training was completed, graduates returned to Great Britain for reassignment in the skies over Europe, North Africa and the Pacific, wherever British forces fought alongside their American allies in the world-wide struggle against Nazi Germany, Fascist Italy and the Japanese Empire. The 23 deceased cadets who died in training were and remain today an inspiration to those alongside whom they trained and those today who remember the principles for which they gave their lives. The Memorial service has been conducted for more than 30 years and includes a wreath laying ceremony, remembrances and tributes to these fallen servicemen. 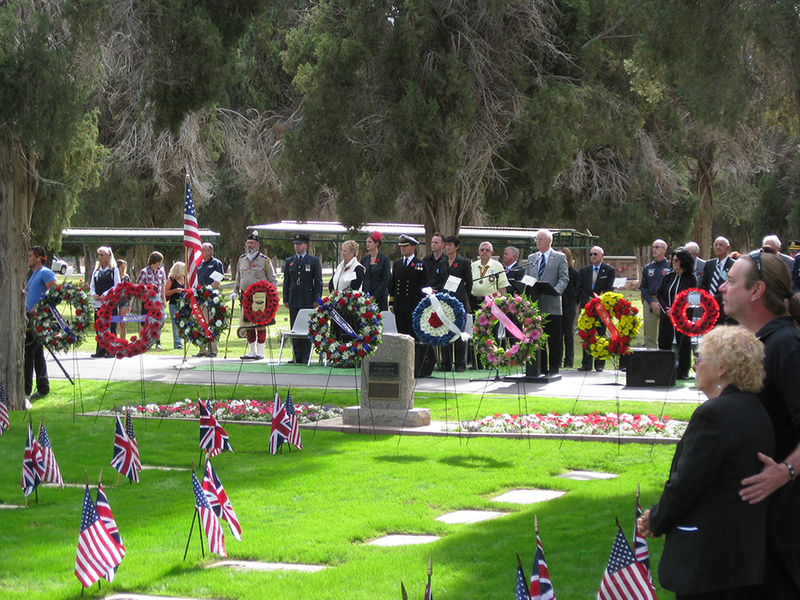 The British Plot is located approximately in the center of the Mesa Cemetery. 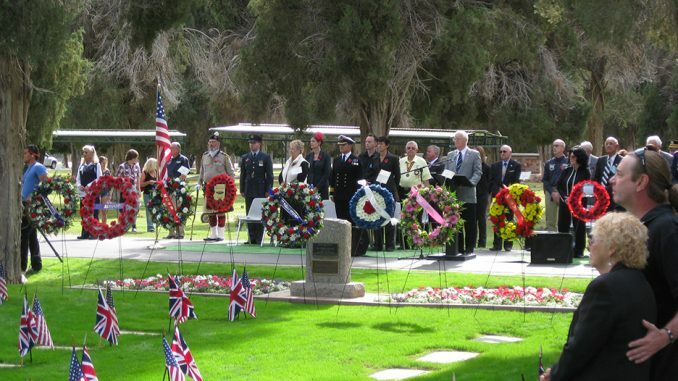 Representatives of Her Majesty Queen Elizabeth II, the Royal Air Force and numerous dignitaries from both the City of Mesa and the British government will be present. The Mesa Caledonian Pipe Band will perform. This is a public event and all are invited to attend. There is no admission charge for this event. Now in its 36th year of operation as the premiere aviation attraction in the Phoenix Metropolitan Area, the Aviation Museum is operated by Airbase Arizona (formerly the CAF Arizona Wing, now honored to be the first designated Airbase of the CAF). Organized in 1978 as the local Arizona chapter of the Commemorative Air Force, the mission of Airbase Arizona is to restore and preserve historically important aircraft and related memorabilia in order to educate the public about the significant contributions made by men and women in the defense of the Nation. Airbase Arizona is home base to a unique collection of twenty historic warbirds, including the famed, fully restored Sentimental Journey, one of the few remaining World War II-era B-17 Flying Fortress bombers still flying today, and Maid in the Shade, a veteran B-25 Mitchell bomber that saw action in the Mediterranean Theater of Operations in World War II.